Chefchouen is a magical little town up in the Rif Mountains, just a short drive from Tangier. The town as an interesting heritage, as it was a home to Spanish refugees in the middle ages, and took in Christian and Jewish refugees alike as the centuries progressed - all of these influences come to bear on visitors' experience of Chefchouen today. The medina of Chefcouen isrenowned as one of the most charming in Morocco, with whitewashed, gabled houses and blue-rinsed buildings where craftsmen sit in their shops sewing caftans and embroidering jellabahs. The medina is dominated by the 17th century Great Mosque, which fronts a picturesque square dotted with mulberry trees and inviting restaurants. The square is also surrounded by souks selling carpets, leather goods, pottery and copper ware. While Chefchaouen has enough picturesque Moroccan charm to attract droves of tourists, another aspect of its popularity is its reputation for recreational drug use (it is the centre of a marijuana and hashish producing region). Probably the best thing to do here is hike. 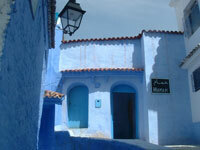 One of the best places to trek to is the tiny, traditional village of Kalaa, hiding in the hills outside Chefchaouen. Here one can relax in the remote serenity of rural Moroccan life that has changed little over the centuries. The village is also a wonderful base for exploring the Rif Mountains and hikes can be arranged to other local villages in the area and all the way to the Mediterranean. As tourism increases more villagers are opening their doors to the trade and new guest houses are springing up in the area.